I had two lone lemons in my refrigerator, begging to be used. Then at the grocery store they had such a good deal on 2 pounds of strawberries that I just had to buy some. So what to do with lemons and strawberries? Well in our house I can never go wrong with coffee cake and I also had found a recipe a few weeks ago that I have wanted to make with the lemons. You definitely can never go wrong with the combination of lemon and strawberries, I love this combination. 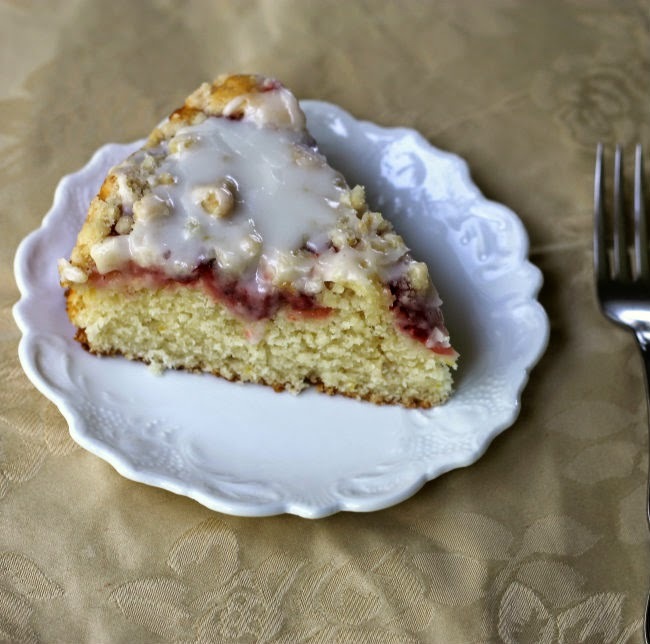 The lemon flavor really is the featured flavor in this cake; you will find it in the cake itself, but also in the crumb topping and the icing. 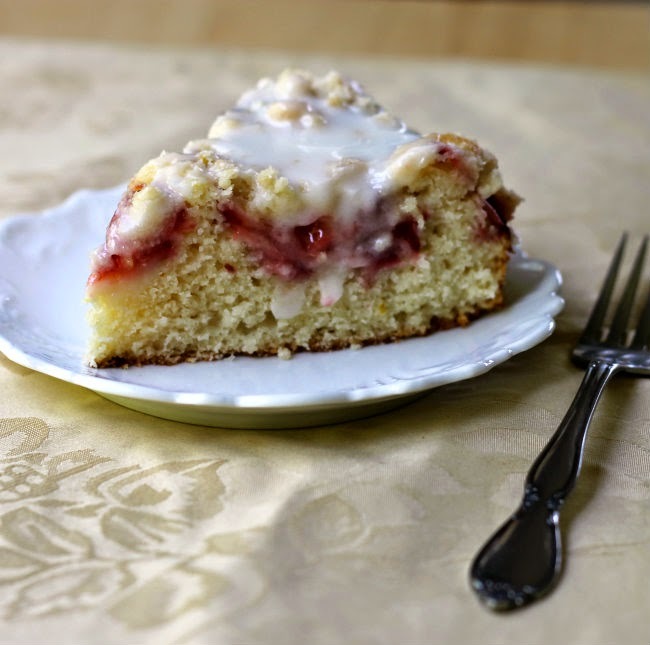 The strawberries add more flavor, but they also add to the moistness of the cake. You can serve this coffee cake warm or cooled completely, either way it is so yummy! 1. In a medium bowl whisk together flour, baking powder, baking soda, and salt and set aside. 2. In another bowl use an electric mixer to beat the butter and the sugar until light. Beat in the egg and 1 tablespoon lemon zest. 3. Mix in 1/3 of the flour mixture to the butter and sugar mixture, followed by the lemon juice. Mix in another 1/3 of the flour mixture, followed by the buttermilk. Mix in the remaining flour, mixing just until the dry ingredients are no longer visible. 4. Pour the cake mixture into a lightly greased 9-inch spring-form pan. 5. 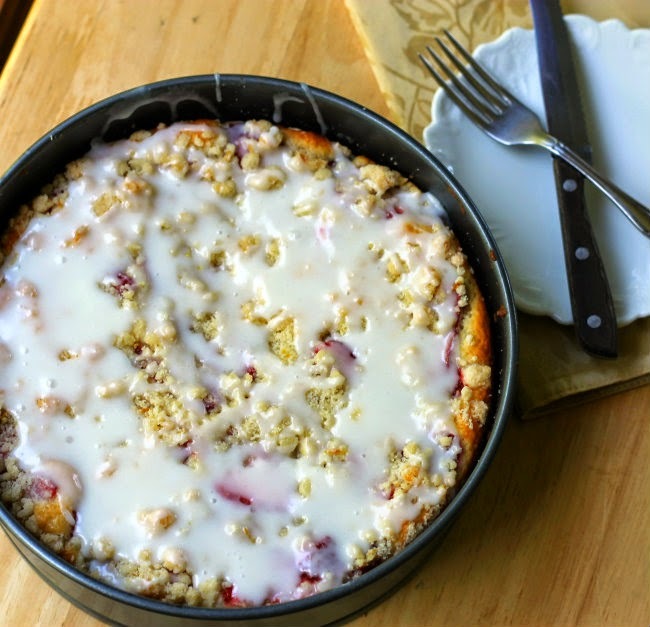 Place the thinly sliced strawberries over top of the cake batter and set aside. 1. In a bowl, whisk together the sugar, 1 tablespoons lemon zest, and salt. Add the softened butter and stir with a fork until mixture is crumbly. 2. Sprinkle over the strawberries. 3. Place the cake into the oven and bake 45 to 50 minutes or until a tooth pick comes out clean. Remove from and place on a cooling rack. 1.In a medium bowl add the powder sugar, dash of salt, butter, lemon juice, and milk, beat until smooth. 2. Drizzle over slightly cooled coffee cake. Serve warm or cooled completely. This is right up my alley, I wonder if I could alter it to use blueberries, which I have in the fridge! Hi Sue, I think that blueberries would be great in this recipe. Lemon and blueberries are another combination that I love. Thanks for stopping by! This is definitely a winning coffee cake combo! How fortuitous that all these ingredients just happened to join forces in your fridge! It looks tasty – wish I had a slice right now. Yum. I would definitely serve this warm. I doubt it would have a chance to cool off around my house. I’m a lemon freak so we always have more than two lemons in our refrigerator. 😉 Which is good, because when I make this I’ll still have some left! This is wonderful — thanks. That looks delicious!!! I’m going to have to try it.